Items are the things you sell in your Bookstore, everything from textbooks and college-branded sweatpants to marginally-edible granola bars and deeply-discounted acupuncture needles. Inventory refers to the nitty-gritty details of your items: How much did the textbooks cost you? How many colors of sweatpants do you sell? How long have the granola bars just been sitting there? What's the list price of those acupuncture needles? This article covers how to add new items for sale as well as how to manage inventory for individual items. In Bookstore > Admin, click Add Item in the left sidebar. On any shopping/category page, including the Bookstore Home view, you'll find Add Item in the right column. 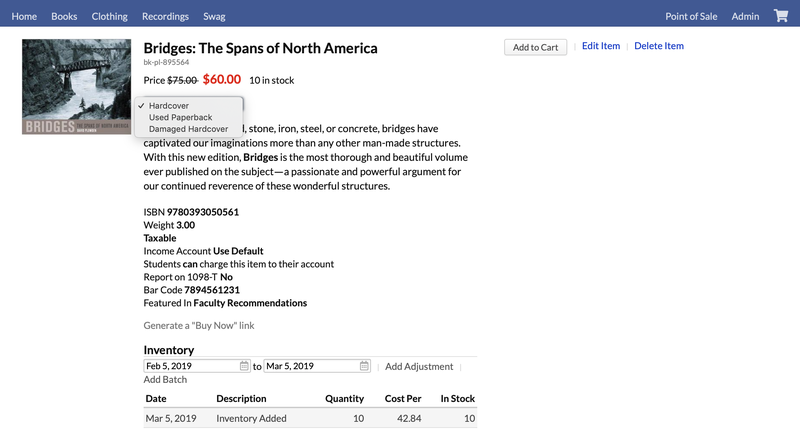 In the Term Book List, any books not in your inventory will show , which lets you add that book as a new item. Click the picture area to upload an item image. Do you want this item to be visible to (online) shoppers or hidden from them? Hidden items can still be sold via Point of Sale. Is the item taxable? Bookstore automatically calculates sales tax for taxable items. Link directly from the course reading list to the item's page in Bookstore. Populate the Term Book List report. Enter the vendor's name. You can add new vendors here or select from existing vendors suggested by the text field. Select the income account to be credited when this item is purchased. Check if students can charge this item to their accounts. Check if charges for this item should be reported on IRS 1098-T forms. Is this item Featured In any of the shopping tabs? Select as many as you wish; when you're done, just leave the last one blank (--). At this point you can scroll to the bottom of the screen and click Save, but first you should probably add at least one inventory segment. Inventory segments are variations of the item. You might sell the same book in hardcover and softcover, or different colors and sizes of school-branded yoga pants. Each variation should have its own inventory segment. Use the segment name to summarize what's unique about this segment (XS red/XS blue, hardcover/softcover, DVD/Betamax, etc.). The SKU is the unique inventory identifier for each segment. List price is usually provided you by the vendor. This field is optional. Price is the amount at which your Bookstore will sell the item. Enter the weight in pounds. This field accepts decimals so you can enter, say, 1.25 to indicate 1 1⁄4 pounds. Enter the barcode; you can just scan this in with a USB barcode scanner. If you like to type long numbers, you can do that, too! Quantity refers to the amount you received in a given order. As you receive new orders from your vendors, you'll add new inventory batches. Our Cost refers to the per-item cost in that order. This amount can vary from one order to the next and is an important component of your inventory cost flow. Click add inventory segment to show the fields for another segment. You can add as many segments as you need. Delete an inventory segment by clicking . When people are looking at this item, inventory segments will be shown in a drop-down. Use the symbols to change the segment drop-down order. By searching for it the Home view or one of the specific category/shopping views. Via the Items report in Bookstore > Admin. Anywhere you might see it linked—order pages, the Inventory report, etc. Generate a "Buy Now" Link: Click this to generate a snippet of HTML code that you can incorporate into another website. When someone clicks the link, he'll be taken to Bookstore with the item added to his cart. Add to Cart: If you want to buy the item, well, you can. Edit Item: Click this to update or change item information. Delete Item: Only do this if the item you're looking at was mistakenly added! Update inventory: See below for how to add and adjust item inventory. The inventory panel shows you the entire inventory history for the inventory segment you're viewing. Change the segment by selecting one from the drop-down below the price. 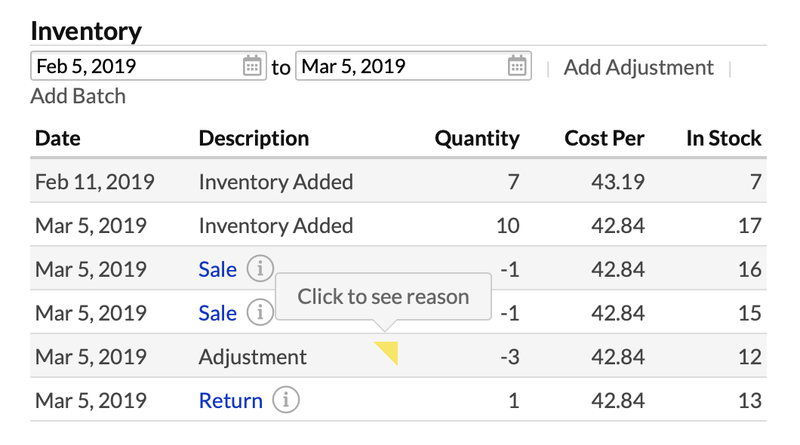 The panel shows you when inventory was added or adjusted and when sales or returns affected the stock. Hover over to see a quick summary of the order details affecting the inventory. Click to see any notes that have been left on adjustments. When you receive a new shipment from a vendor, you'll enter an inventory batch. First, if you're entering inventory for an item with multiple segments, make sure you're viewing the correct segment! Enter the quantity. 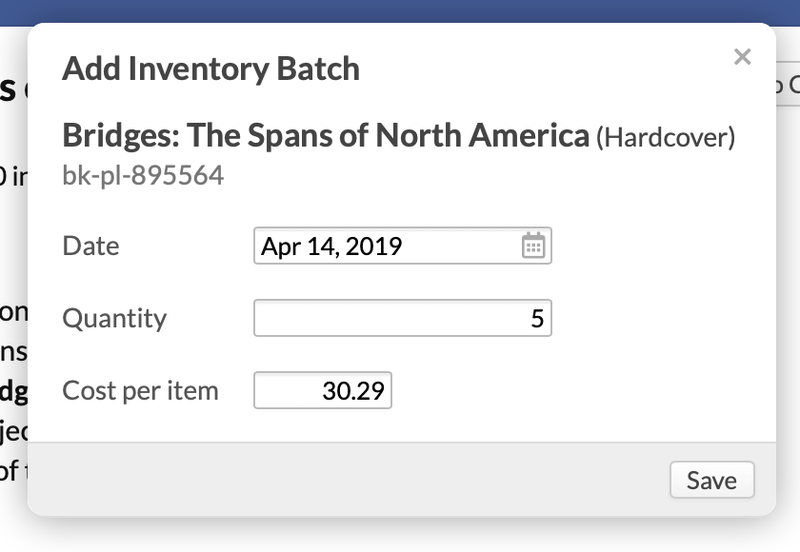 This field autofills with the quantity from the last batch entered for this item/segment, but changing that ain't no big deal. Enter the cost per item. Likewise, this field autofills with the last cost. Cost per item is used in your inventory cost flow calculations. Now that you've added this batch, your inventory has increased and you have more stuff to sell! 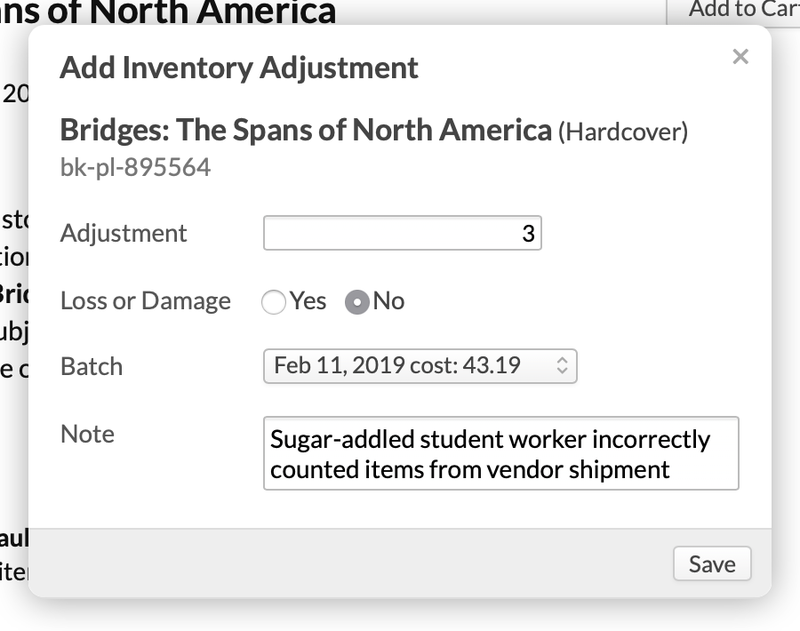 Inventory adjustments let you note loss or damage to stock or fix errors in an inventory batch (say, you counted wrong when unpacking the shipment). Enter the amount of the adjustment. If it's a reduction of any kind, simply enter a negative number (e.g. -4). Check whether this adjustment is for loss or damage. If it is, the inventory reduction will be automatically accounted for based on your inventory cost flow method. If this is not for loss or damage, select the inventory batch this adjustment affects. Enter a note, especially if you're noting damage caused by spilling some hot, sweet coffee drink all over that new shipment of school-branded yoga pants. Now that you've adjusted the inventory, it is reflected in the stock total. If an adjustment for loss/damage, a corresponding entry has been created in the general ledger. There are two inventory views in Admin: Add Inventory and the Inventory report. 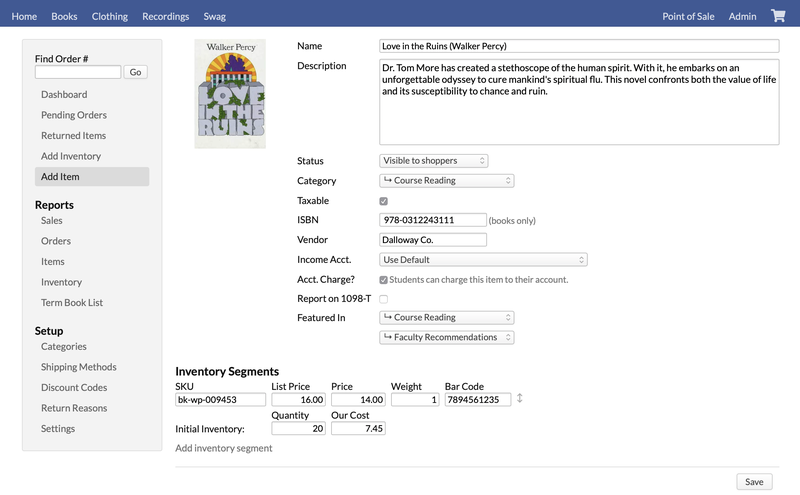 Add Inventory lets you add inventory batches to any existing item/segment in your Bookstore. You can also view any recently-added inventory batch. If no items from a batch have been sold yet, you can delete the batch by clicking . Find the item/segment by scanning the item's barcode or using the item search. Follow the instructions for adding an inventory batch. Now that you've added this inventory batch, you'll see it under Recently Added; it will also appear on the item's page under Inventory. The Inventory report lists all of your inventory segments. You can filter the report or export a spreadsheet of it. Is it possible when you add books from the Term Book list, that the picture of the book also appears in the Bookstore? It seems this took place under the Required textbooks for the students, but not in the Bookstore. This would be very helpful for me, too. Question: are SKU and barcode the same numbers? SKU and barcode could be the same number. They don't need to be; SKU can be whatever you want it to be. Does the program link to the Spring Arbor or Ingram data base so we can update when there are new books or price changes? Can you give different discounts to different customer categories?